The new Transformers movie, a.k.a. Transformers 3, a.k.a. 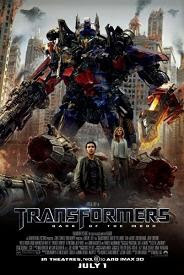 Transformers: Dark of the Moon, is everything you would expect from it: loud, colorful, stupid and pathetic. All that presented in glorious 3D. It is a big and relatively long movie with a lot of everything. And by being so exorbitant it transcends its stupidity and turns it into a statement. The movie's massiveness leaks in every scene. It starts with a totally unnecessary and messy sequence showing the inception and execution of the Apollo flight to the Moon. This sequence mixes documentary shots with staged scenes and serves as an extremely boring introduction. All the more boring considering how it is all told in the trailers already. It really is about time summer blockbusters leave Kennedy docu shots to rest. They were only semi-interesting the first one hundred times. Transformers: Dark of the Moon also has Buzz Aldrin (the second guy on the Moon) playing himself. Ain't that grand? This intro sequence is quite symptomatic cause randomness is all over the movie. One part due to the laughable script. Scenes and characters consistently lack motivation. Stuff happens for the sake of it. Scene after scene, the Autobots come to save the day (and our heroes) after the forementioned heroes have struggled for 20 minutes of screen time while the Autobots have seemingly been relaxing around in the meantime. Boy, these Autobots certainly have a thing for dramatic entrance. Speaking of the dramatic, Transformers: Dark of the Moon sports an excess of lame pathos. There is a horde of wacky supporting characters. Apparently Bay liked John Turturro so much from the first two Transformers movies that he now has him and a whole bunch of other weirdos, played by Frances McDormand, John Malkovich, Alan Tudyk and Ken Jeong. Having such actors playing these random wacko roles is so self-indulgent in its pointlessness that it is impressive. It is almost like if Bay was looking for some kind of artistic credibility by casting them. Oh well, we surely don't mind and here go our congrats for their fat paychecks. Continuing the excessiveness is the large cast of new transformers (mostly Decepticons). There are more of them and they all lack the slightest bit of personality. This is an inherited problem from the first two movies, but worth mentioning anyway. From the Autobots only Optimus and Bumblebee have any distinctive personality. There are, of course, a bunch of smaller transformers which are probably inspired by the more recent George Lucas' works. At least, they can successfully rival his creations in their annoyance. One thing you can't accuse Bay of is the lack of style. His style may be too obvious, or insultingly straight to the point of being cringe-worthy, but it is still there. It is interesting how his trademark slow motion shots and fast action cuts mix with the 3D environment. Fast cuts and 3D don't mix well in general (the eye needs time to accommodate spatial changes). Bay has slowed down a bit in this department. Action is still fast cut, but not to the point of the previous movies. The filmmakers have also utilized both on-set 3D image capture and post-processed 3D (for the slow motion scenes, of which there are plenty). Now for the good stuff: hand-to-hand mech combat can't go old (too bad there is not much of it); the new girl is not a worse actress than Megan Fox (which doesn't say much, indeed); depending on your attitude, you may find the wackos mentioned above mildly amusing. In conclusion, Transformers 3 is a glorious mess. It is a huge and noisy flick that you may find occasionally interesting if you are willing to not grumble over the boring, annoying and insultingly stupid parts (which is most of the movie anyway). It will also keep you informed of the way Hollywood is going to. So, yeah, that's something. For more reviews of movies explore our Review Maze.